In spite of only having a splinter of market share to its name, BlackBerry isn't finished until now with the smart phone marketplace yet, and the corporation obviously thinks that Android is the way to resolve its platform's crippling need of modern-day apps. Enter the BlackBerry Venice, an Android-powered phone with a QWERTY keyboard that we've been earshot rumors of for some time. There's been no verification from BlackBerry yet but there's a rising pile of clues that the handset is certainly on the approach. Specifications wise we're perhaps looking at a 1.8GHz Hexa-core Snapdragon 808 processor balancing with 3GB of RAM. A 5.4-inch QHD screen will feature actually accompanied by a micro SD slot for totaling further storage. 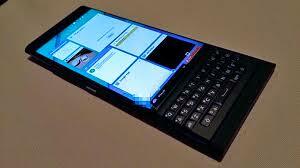 If the newest version of Android isn't sufficient to attract punters, this can be the final BlackBerry smart phone - CEO John Chen went on verification this weekend to say that if BlackBerry can't make money from mobiles then it will get out of the production.